Jez Browning is an ASI Level Master surf instructor. Originally from Guernsey, but now based in Lagos, Portugal, Jez offers intense training and tuning weeks for developing surfers at locations all over the world. These UniSURFITY weeks are aimed at giving 1 to 1 style coaching but in a small 6 person group. 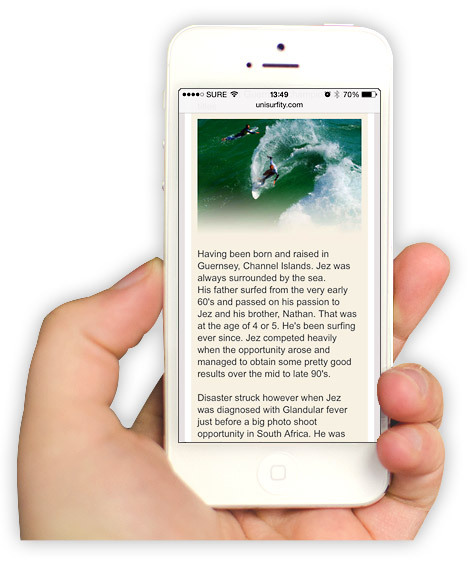 The website design needed to be clear, simple & appealing to those attracted to the surf lifestyle. The use of photography & video was paramount in conveying what Jez’s UniSURFity ‘boot camps’ are about and what participants can achieve from a week training under him. It was also important that UniSURFity had a mobile-friendly website that users were able to check out on the move. The website is optimised for both Apple & Android mobile phones as well as tablet devices. Jez wanted a website that he was easily able to update and add to himself. The site I deployed was built on a content managed platform which means that he can update the website whether he’s at home on his laptop or at the beach on his mobile phone. Updates are made via a secure web login. The user friendly content management system (CMS) means that no coding or technical knowledge is required to keep the site up to date with photographs from that day’s training or exciting details of up and coming trips. UniSURFity is prevalent over multiple Social Media channels so it was also important that the website seamlessly integrated with his Facebook, Twitter, YouTube and Instagram activity. 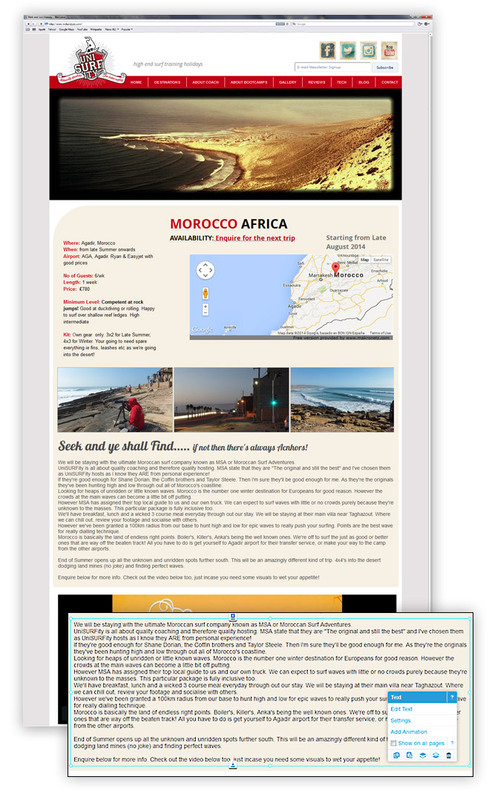 This was achieved by adding linked icons in the header and footer of each page as well as displaying photographs from his Instagram feed in the footer. Videos from the UniSURFity YouTube channel are also incorporated into the content of the website. In addition to linking external Social Media channels, the website also has a built in Blog which Jez is able to use to add the latest news, videos and photographs. The inclusion of a blog and constant new content has fantastic SEO benefits for the website and means that search engines will consistently place the website at the top of their result pages. If you would like help or advice with web design, setting up a new website or redeveloping an existing one, please get in touch, I’d be happy to discuss your requirements.